National Insitute of Warangal (NIT Warangal) was established in the year 1959. It was known as formerly known as Regional Engineering College. NIT, Warangal is now a deemed university. National Insitute of Technology, Warangal has a massive supportive infrastructure. The institute is known for its dedicated staff and faculty and has been successfully able to develop higher levels of technical excellence. UNESCO and the World Bank has significantly contributed towards the infrastructural and technical support of this institute. The institute is residential with 3355 students in undergraduate and postgraduate courses and about 269 Phd scholars. There are 100 well-equipped laboratories, a central Library, auditorium, student activity centre, indoor games complex, computer centre, a huge stadium, seminar halls, etc. on campus to provide a healthy conducive learning environment to the students. NIT, Warangal has 16 residential blocks and one huge central mess to accommodate such huge number of students at once. The campus is well-built and spread across massive land area of 248 acres. There is an on-campus banks with ATM facility. It has library, conference halls, hostel, centre for innovation, maintenance and engineering, etc. There are 13 academic departments and a few advanced research centres in the institute. The departments include Biotechnology, Chemical Engineering, Civil Engineering, Mathematics, Chemistry, Computer science and engineering, electrical engineering, electronics and communication engineering, humanities and social science, mathematics, mechanical engineering, and, metallurgical and materials engineering. The institute offers higher studies in engineering, management and pure sciences. The institute offers 8 undergraduate programs as B.Tech specializations, 29 post graduate programs as M.Tech, MCA, MSc, and MBA. The institute is well-known for its training programs for teachers and industrial personnel. NIT Warangal has 200 teaching staff and 360 administrative staff. 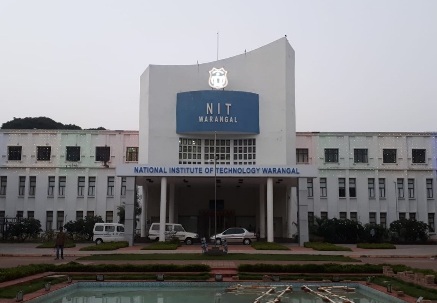 NIT Warangal is located at 140 kms from Hyderabad. According to Outlook Survey 2015, the National Institute of Technology, Warangal is ranked as the 11th best technical institutes of the country. The candidate must appear in JEE main entrance exam to get admission in B.Tech program of NIT, Warangal. The candidate must have secured 75% marks in 12th passed. Physics and Maths are the two compulsory subjects in 12th class. The aspirants are called for counseling on merit basis in JEE main entrance exam. For admission to M. Tech programs, the candidates are required to clear GATE exam. Why must you seek admission in NIT, Warangal? • NIT Warangal has good faculty which means you get an opportunity to learn the technicalities of engineering well. • NIT Warangal has well-equipped laboratories dedicated to all specific streams. • NIT Warangal has a good placement record. You must secure a descent cgpa, and good job opportunities will automatically find their way. About 80% of the students get placed conveniently on campus. • The campus of NIT Warangal is the best amongst all other NIT’s. • NIT Warangal offers a great environment for learning and growth. At the same time, it is a lot of fun to study and spend time on campus. • There are plenty of extracurricular activities in sports and there are plenty of different clubs for students to learn by testing their creativity and interests. • There are various fests and events organized in the college each year. These events are organized and executed by the students. The students get hands on exposure of public speaking, managing many large scale events, confidence, etc. • The institute has great technical support and has well-equipped infrastructure to support healthy learning environment. • CE (Civil Engineering) is considered to be the best in NIT, Warangal. • There are plenty of eateries and hang outs around NIT Warangal to keep the students entertained. • It is the only engineering institute which ran a student exchange program between India and Overseas Development Administration in UK in 2004. This program was started in the year 1994 and stopped later in 2000. But, such healthy exchange of culture and learning brought a great deal of growth in the learning environment of the institute. • Since 2012, NIT Warangal entered in 12 MOUs with 12 European Higher education insitutes. • NIT Warnagal has a self-sufficient campus with all basic amenities. It also have on-campus bank and ATM. The campus also has a shopping centre to cater to the needs of the students. • The campus has a post -office for students to send across and receive letters from their families and friends. There is well-developed medical facility available on campus. There is an X-Ray machine, pathology lab, and an ECG machine on campus for investigations and health check-up of students as well as the staff. • National Institute of Technology, Warangal is just 12 kms from Warangal Railway Station and 167 kms from Rajiv Gandhi International airport, Hyderabad. • Warangal is a safe city for students to reside in. Girls can freely roam around the city without any fear. • NIT Warangal has an innovation and incubation centre to promote start-ups. A few start-ups have already started their functioning in this centre. • It has a huge library with 1,57,596 books and 2000 online journals and a virtual library. NIT Warangal is usually a top priority for most students. The college is known for having the best infrastructural support in the country. It is surely a great choice to make sor pursuing engineering studies.